I cook cakes very often, but I always want to cook even familiar cake in a new role. I decided to share my creation, as husband and daughter put excellent mark. At first I had a completely different idea, but it turned out not quite well in terms of appearance and while I pondered whether I should take pictures of what happened the cake was eaten mercilessly. I had to prepare another with completely new ideas. What turned out of it – welcome, please visit! 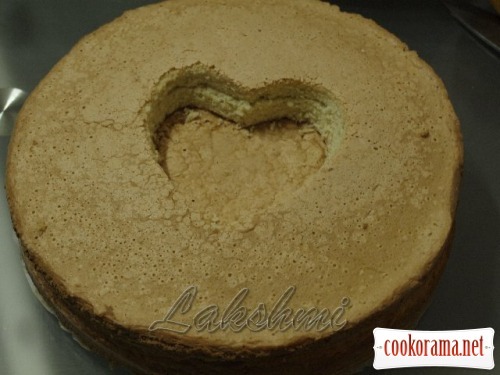 For this cake I used round baking form of 24 сm in diameter. At first, you should bake 2 biscuits separately. Mix eggs to an increase in volume, gradually pouring sugar. Mix for 7 min. Next, gradually add flour (sprinkle) and stir with spatula from the bottom up. Cover bottom of form with parchment, pour batter and twist form a bit clockwise (then there will not be bulge in the middle of biscuit) and bake for 30-35 min at 180 C.
Cool both biscuits on grid and cut each in half. We`ll have 4 flat cakes. 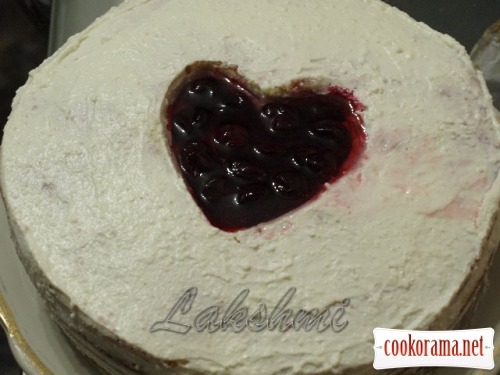 Using a template, cut out two hearts in the center of two flat cakes. Prepare cream: Mix all ingredients in food processor until smooth. The cream turns out thick and is smeared on flat cakes well. 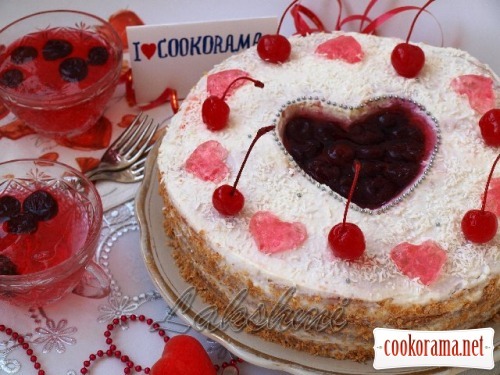 Mix cherry juice with cognac for impregnation of cake. Begin to assemble the cake. Soak first flat cake with juice from cognac, grease with cream. Cover with second flat cake, soak it and smear with cream too. 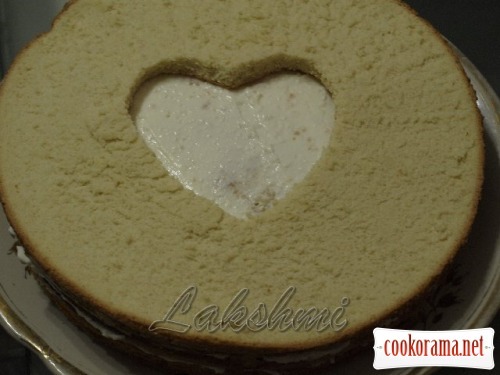 Next, put third flat cake, with cut out heart. 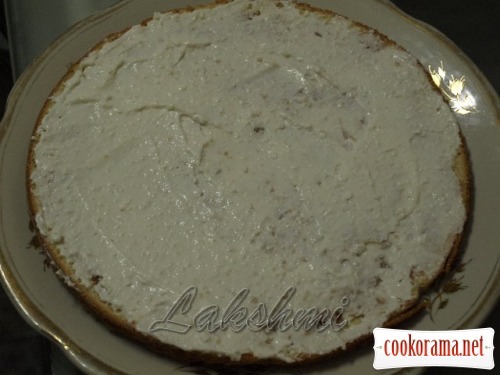 Soak flat cakes and smear with cream. D the same with fourth flat cake. 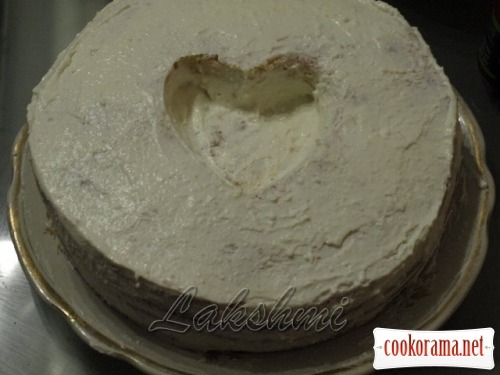 Smear recess with heart inside well with cream. Also smear sides of cake with cream and put cake in the fridge for an hour. While cake stands in the fridge, prepare jelly. I used ready cherry one, but you can take compote and add gelatin in it. Melt ready jelly in hot water, not as it said on package (in 400 ml), but take — 200 ml. Cool it. 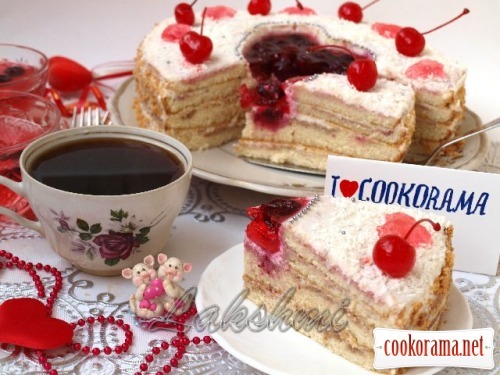 Remove cake, in recess «heart» put cherries densely and carefully pour with cooled jelly. Put again in fridge. When the jelly hardens, pull out the cake and decorate it. I am not master of decorating cakes, so decorated as could. Sprinkle top of cake with coconut and crumbs from sides, that were cut out. Spread heart with confectionery beads. Yet I remained jelly and I had laid it in molds for ice — after frozing decorated cake by these hearts with a cocktail cherries. Cake soaked overnight and just melted in mouth! I wish " Cookorama " prosperity and development, and to all its inhabitants love, peace and good! 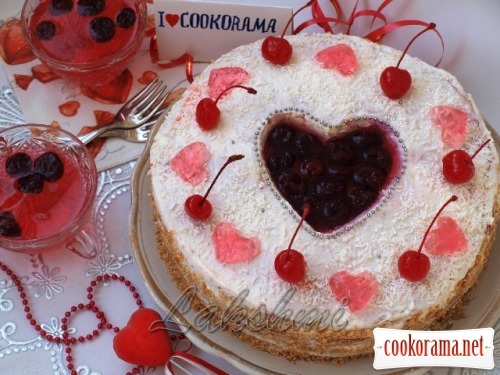 Top of recipe "Cake "Heart for Cookorama""
Recipes, Cakes, Cake "Heart for Cookorama"